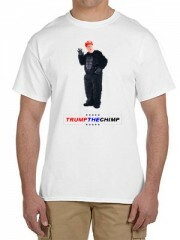 Trump The Chimp – Pre-Order Your Shirts Today! So, you are asking yourself, amid all the controversy about Donald Trump and his campaign for president and his statements — Why a website like this? Especially why a website named Trumpthechimp? 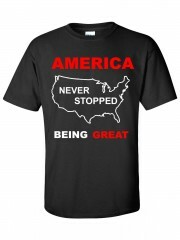 Well, most of the credit goes to my son. Both he and I were familiar with the work done by the primatologist Jane Goodall DBE. Specifically we knew of one of the more famous chimps, viz. Mike the chimp. Mike rose, instantly, albeit after a bit of careful planning, from the lowest ranking chimp in a troop to the highest ranking (Alpha Male) by the expedient of making a lot of empty noise and charging the leader. I made a remark about trump being where he is by virtue of a lot of empty noise, and my son said “Trump the Chimp.” I said What?? And my son repeated the statement saying that Donald Trump is like Mike the chimp. In reality the leaders did not always make the best contribution to the task, but their voices were usually heard first and most often. Now this does not apply to long term groups, where eventually actions to speak louder than words. But Elections are not long term events. Rather you have a lot of people talking as much as they can, engaging in almost no meaningful actions, and then an event, an election, that lasts a day. There is this Indonesian proverb: An empty drum gives loud sound. See also chapters 20 & 21. My guess is that the equivelant for trump of mikes first can banging would be his book “the art of the deal”, and the apprentice tv show. When he saw how well packaged “nothing” could produce such a reaction, I guess that he figured — well not try and be alpha male.